As part of my Letters from a Vocal Coach e-Book series, this is my eighth installment of the speech level singing variation to the arpeggios exercise on track 6 on the CD. Speech Level Singing Arpeggios Exercise with Joett (Part 8) is a helpful video demo of the exercise using the vowel 'A'. To get the full workout, please download my FREE Arpeggios Exercise mp3 to the entire scale. All you need to do is have a look at the video to see the scale variation I have illustrated for you, and then download the Arpeggios Exercise mp3 lifted from my Learn to Sing with Joett Vocal Training CD and ideally, burn that onto CD so you can play it on your music system. The bigger the sound the better the workout ... and the better you get to train your ear. WORK WITH VOWEL 'A' to the top note in the exercise with a clear and connected tone is what you're gunning for here. As you go higher, you'll begin to feel your voice go more and more behind the soft pallet and into your head. Just let it happen. Take your time. Make sure you breathe before each note (like I do in the video clip), and make sure you're singing in key. The first round has my voice, so listen to that very carefully, and then come in in the next key up (with only the piano). Just make sure you're bang in key and remember to keep your voice connected from your chest voice into your head voice the higher you go. Have fun! Whence training one of my pupils the other day, I came across this little stumbling block that was evidently impeding my pupil’s progress as a singer: Holding back. Not letting it out. Not allowing oneself to let go of your old ghosts to find your musical freedom. Your TRUE artistic freedom! This is a pretty common scenario. I come across this all too often. When you've done the training, to the letter, and by this I mean singing in key, working your way up and down the scales with a clear, powerful, connected tone and with good control, you SHOULD be able to do exactly that when you sing ANY song. Training prepares the voice. It prepares YOU. It helps you FIND your true voice. So why then should you not use that to YOUR advantage? I know… it's easy to regress into your old ways, but if you really want to improve your singing voice, allow yourself to adapt to change. Stop holding on to the past! USE your voice. Don't hold back. Let it out! It really is that simple. What you need to understand is that if your voice has been there in training, it can do it again if you let it. So instead of THINKING too much, WORRYING too much and such like—let the voice do the job it is meant to do. If it HAS been there before in training, YOUR voice can do it again when you sing a song. Try to understand WHY you train. And try to APPLY your training. Best way to go about it, is to just let it happen. 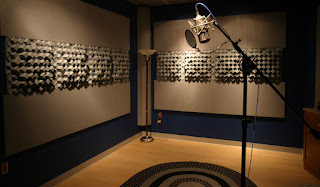 Throw away your inhibitions and Sing with Complete Artistic Freedom! It's a lot easier than you think. As part of my Letters from a Vocal Coach e-Book series, this is my seventh installment of the speech level singing variation to the arpeggios exercise on track 6 on the CD. Speech Level Singing Arpeggios Exercise with Joett (Part 7) is a helpful video demo of the exercise using the vowel 'O'. To get the full workout, please download my FREE Arpeggios Exercise mp3 to the entire scale. All you need to do is have a look at the video to see the scale variation I have illustrated for you, and then download the Arpeggios Exercise mp3 lifted from my Learn to Sing with Joett Vocal Training CD and ideally, burn that onto CD so you can play it on your music system. The bigger the sound the better the workout ... and the better you get to train your ear. WORK WITH VOWEL 'O' to the top note in the exercise with a clear and connected tone is what you're gunning for here. As you go higher, you'll begin to feel your voice go more and more behind the soft pallet and into your head. Just let it happen. Take your time. Make sure you breathe before each note (like I do in the video clip), and make sure you're singing in key. The first round has my voice, so listen to that very carefully, and then come in in the next key up (with only the piano). Just make sure you're bang in key and remember to keep your voice connected from your chest voice into your head voice the higher you go. Have fun! As part of my Letters from a Vocal Coach e-Book series, this is my sixth installment of the speech level singing variation to the arpeggios exercise on track 6 on the CD. Speech Level Singing Arpeggios Exercise with Joett (Part 6) is a helpful video demo of the exercise using the vowel 'U'. To get the full workout, please download my FREE Arpeggios Exercise mp3 to the entire scale. All you need to do is have a look at the video to see the scale variation I have illustrated for you, and then download the Arpeggios Exercise mp3 lifted from my Learn to Sing with Joett Vocal Training CD and ideally, burn that onto CD so you can play it on your music system. The bigger the sound the better the workout ... and the better you get to train your ear. WORK WITH VOWEL 'U' to the top note in the exercise with a clear and connected tone is what you're gunning for here. As you go higher, you'll begin to feel your voice go more and more behind the soft pallet and into your head. Just let it happen. Take your time. Make sure you breathe before each note (like I do in the video clip), and make sure you're singing in key. The first round has my voice, so listen to that very carefully, and then come in in the next key up (with only the piano). Just make sure you're bang in key and remember to keep your voice connected from your chest voice into your head voice the higher you go. Have fun! As part of my Letters from a Vocal Coach e-Book series, this is my fifth installment of the speech level singing variation to the arpeggios exercise on track 6 on the CD. Speech Level Singing Arpeggios Exercise with Joett (Part 5) is a helpful video demo of the exercise using the vowel 'E'. To get the full workout, please download my FREE Arpeggios Exercise mp3 to the entire scale. All you need to do is have a look at the video to see the scale variation I have illustrated for you, and then download the Arpeggios Exercise mp3 lifted from my Learn to Sing with Joett Vocal Training CD and ideally, burn that onto CD so you can play it on your music system. The bigger the sound the better the workout ... and the better you get to train your ear. WORK WITH VOWEL 'E' to the top note in the exercise with a clear and connected tone is what you're gunning for here. As you go higher, you'll begin to feel your voice go more and more behind the soft pallet and into your head. Just let it happen. Take your time. Make sure you breathe before each note (like I do in the video clip), and make sure you're singing in key. The first round has my voice, so listen to that very carefully, and then come in in the next key up (with only the piano). Just make sure you're bang in key and remember to keep your voice connected from your chest voice into your head voice the higher you go. Have fun! As part of my Letters from a Vocal Coach e-Book series, this is my fourth installment of the speech level singing variation to the arpeggios exercise on track 6 on the CD. Speech Level Singing Arpeggios Exercise with Joett (Part 4) is a helpful video demo of the exercise using the vowel 'A' (sung Err). To get the full workout, please download my FREE Arpeggios Exercise mp3 to the entire scale. 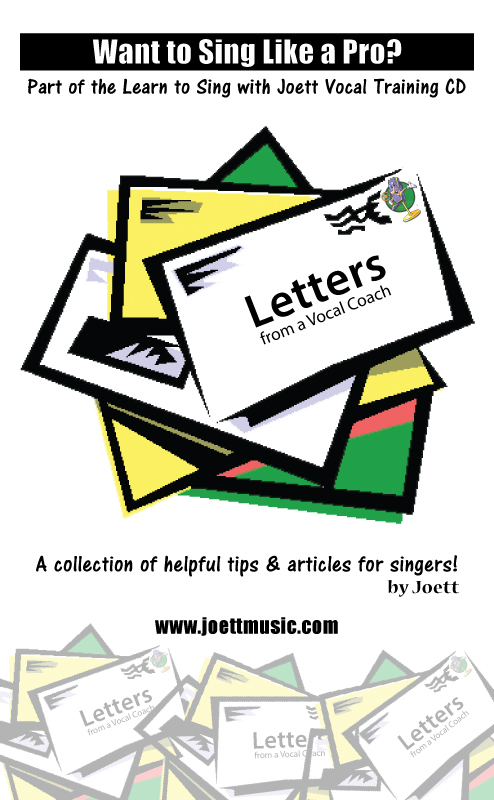 All you need to do is have a look at the video to see the scale variation I have illustrated for you, and then download the Arpeggios Exercise mp3 lifted from my Learn to Sing with Joett Vocal Training CD and ideally, burn that onto CD so you can play it on your music system. The bigger the sound the better the workout ... and the better you get to train your ear. WORK WITH VOWEL 'A' (sung Err) to the top note in the exercise with a clear and connected tone is what you're gunning for here. As you go higher, you'll begin to feel your voice go more and more behind the soft pallet and into your head. Just let it happen. Take your time. Make sure you breathe before each note (like I do in the video clip), and make sure you're singing in key. The first round has my voice, so listen to that very carefully, and then come in in the next key up (with only the piano). Just make sure you're bang in key and remember to keep your voice connected from your chest voice into your head voice the higher you go. Have fun! As part of my Letters from a Vocal Coach e-Book series, this is my third installment of the speech level singing variation to the arpeggios exercise on track 6 on the CD. Speech Level Singing Arpeggios Exercise with Joett (Part 3) is a helpful video demo of the exercise using the vowel 'I'. To get the full workout, please download my FREE Arpeggios Exercise mp3 to the entire scale. All you need to do is have a look at the video to see the scale variation I have illustrated for you, and then download the Arpeggios Exercise mp3 lifted from my Learn to Sing with Joett Vocal Training CD and ideally, burn that onto CD so you can play it on your music system. The bigger the sound the better the workout ... and the better you get to train your ear. WORK WITH VOWEL 'I' to the top note in the exercise with a clear and connected tone is what you're gunning for here. As you go higher, you'll begin to feel your voice go more and more behind the soft pallet and into your head. Just let it happen. Take your time. Make sure you breathe before each note (like I do in the video clip), and make sure you're singing in key. The first round has my voice, so listen to that very carefully, and then come in in the next key up (with only the piano). Just make sure you're bang in key and remember to keep your voice connected from your chest voice into your head voice the higher you go. Have fun! As part of my Letters from a Vocal Coach e-Book series, this is my second installment of the speech level singing variation to the arpeggios exercise on track 6 on the CD. Speech Level Singing Arpeggios Exercise with Joett (Part 2) is a helpful video demo of the exercise using the tongue trill. To get the full workout, please download my FREE Arpeggios Exercise mp3 to the entire scale. All you need to do is have a look at the video to see the scale variation I have illustrated for you (tongue trill), and then download the Arpeggios Exercise mp3 lifted from my Learn to Sing with Joett Vocal Training CD and ideally, burn that onto CD so you can play it on your music system. The bigger the sound the better the workout ... and the better you get to train your ear. TONGUE TRILL your way to the top note in the exercise with a clear and connected tone is what you're gunning for here. As you go higher, you'll begin to feel your voice go more and more behind the soft pallet and into your head. Just let it happen. Take your time. Make sure you breathe before each note (like I do in the video clip), and make sure you're singing in key. The first round has my voice, so listen to that very carefully, and then come in in the next key up (with only the piano). Just make sure you're bang in key and remember to keep your voice connected from your chest voice into your head voice the higher you go. Have fun! As part of my Letters from a Vocal Coach e-Book series, I've not only recorded video demo Speech Level Singing Arpeggios Exercise with Joett (Part 1), I have also given you a FREE Arpeggios Exercise mp3 to the entire scale. 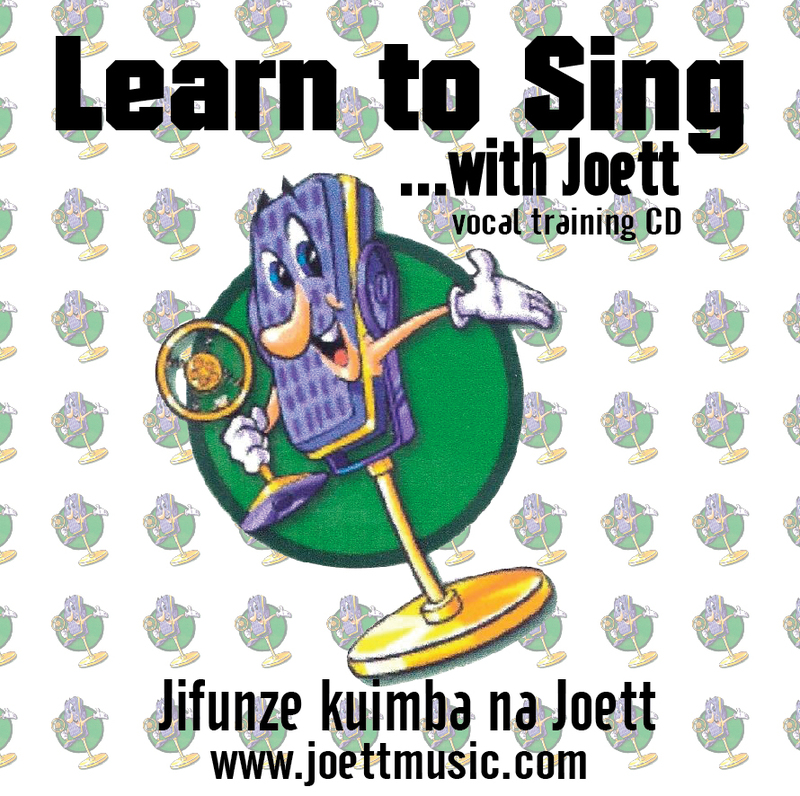 All you need to do is have a look at the video to see the scale variation I have illustrated for you (humming), and then download the Arpeggios Exercise mp3 lifted from my Learn to Sing with Joett Vocal Training CD and ideally, burn that onto CD so you can play it on your music system. The bigger the sound the better the workout ... and the better you get to train your ear. HUMMING your way to the top note in the exercise with a clear and connected tone is what you're gunning for here. As you go higher, you'll begin to feel your voice go behind the soft pallet and into your head. Just let it happen. Take your time. Breathe before each note, and make sure you're singing in key. The first round has my voice, so listen to that very carefully, and then come in in the next key up (with only the piano). Just make sure you're bang in key and remember to keep your voice connected from your chest voice into your head voice the higher you go. Have fun!